BARA, Sept 25: Queue of heavy trucks loaded with timbers is not an unusual scene on the streets of Birgunj. 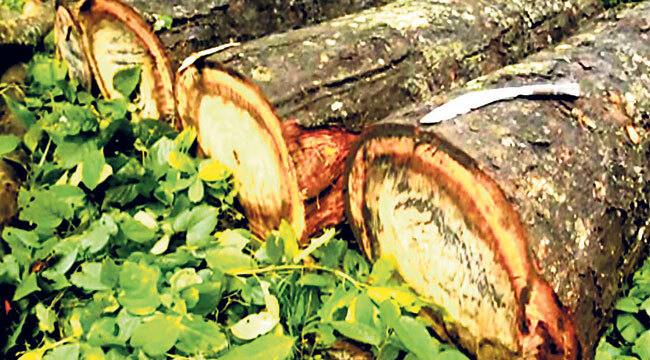 Rampant timber smuggling right under the nose of the authority speaks volumes about the close connection between the smugglers and the concerned stakeholders, locals claim. Just two weeks ago, the forest department had recovered machineries used for cutting trees and chopping lumbers. 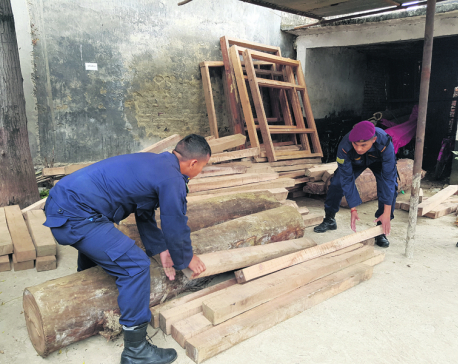 The police had also confiscated huge quantity of timbers during the raid. However, locals are not impressed. “They carry timbers day and night, but no action is taken against them. 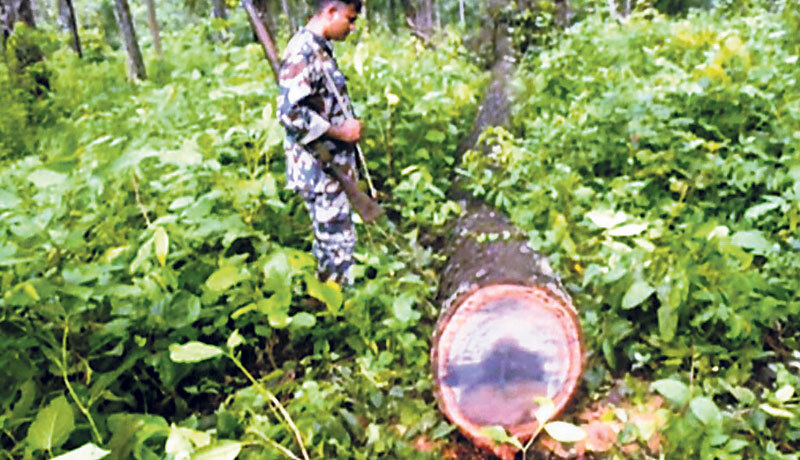 It is apparent that some officials at the forest department are involved in the smuggling. Such acts make them no different than the smugglers,” a local said requesting anonymity. He added that occasional raids by the forest department officials were just face-saving acts and they did not affected the timber smuggling. with timber smugglers. But my hands are tied. I am not authorized to question them. Massive deforestation in the chure range and other forest areas has been reflecting adverse effect on the region. The impact includes fast disappearing water sources and dry fields and these have directly affected the daily life of the region’s inhabitants. Affected directly, they accuse the government of not taking sufficient actions to check the massive deforestation, they claim, is going around them. According to Jeevan Kumar Thakur, chief of District Forest Office (DFO), Bara, investigation on the recently recovered timber and machines is going on. “We took a truck with timber under control. We also recovered some machineries left in the jungle,” he said. He added that none of the smugglers or timber carriers could be held. “As the investigation proceeds, we may be able to arrest and held the responsible for the crime committed,” he added. Thakur further said that the truck used for the smuggling was found registered under name of Binod Shah of Birgunj sub metropolitan city. “But the truck was hired by someone else,” he informed. Smuggled timber lumbers seized by the District Forest Office, Bara. Conserving forest is considered a sensitive and intensive job as it entails the responsibility of guarding the vast stretch of forests continuously against timber smugglers. However, officials at the DFO admit that ‘taking leave’ is not a big deal for them. Most of the time they are found absent from their duty and they put the blame on each other’s shoulder for the absence. They are expected to be guarding forest and carrying out regular inspections but most of them don’t do it and some even claim field trip benefits from the office. DFO chief Thakur conceded that some employees might not be fulfilling their duties though they claim the benefits from the office. There are 18 area forest offices in Bara. But locals claim that there has been massive smuggling of timber from Simara, Nichgarh, Pathlaiya, Haraiya, Sigaul and Ratanpuri, among other places right under the nose of these forest offices. “The smugglers actually have very close connection with the officials. Their morale is very high. Smuggling of timber from here is not a new thing,” said Baliram Yadav of Hariya. “In fact, they enter the jungle with heavy trucks just because they know that they won’t be booked,” he added. When questioned about the lack of actions against the involved officials, DFO Thakur said he is not authorized to that question officials that are suspected of having nexus with the timber smugglers. “I have suspicions of some officials having nexus with timber smugglers. But my hands are tied. I am not authorized to question them,” he said.